The effect of a garden water feature upon a landscape is magical. It brings a sense of place to a garden that rarely fails to capture our interest and more often than not brings a quietness to our spirit. But no matter what the size of your space, there never seems to be enough space to manage all of your needs and wants. 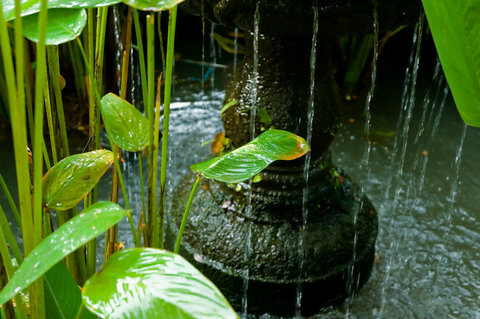 Planning water elements into a small garden can seem like a luxury, but with the right focus and planning, a garden water feature will add immense value. Let's look at how to achieve the balance that will produce a final effect that blends into your overall design and becomes a treasured asset in the garden. 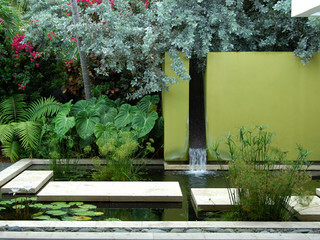 Contemporary Landscape design by Miami Landscape Architect Raymond Jungles, Inc.
As with any design planning, understanding how you want to use the space is the most basic building block for a great end product. It's all about the beauty! Nothing else matters...you want gorgeous and no two ways about it. You are willing to sacrifice all else for a conversation piece. You're a drama queen, and happy about it. You need a dramatic or spiritual setting. I want more plants!!! You are all about collecting the latest pretty faces...in droves if possible. Money...no object. Space? You just want more. Zones? Who cares...Just let me at 'em! Plan your garden water feature for planting. Give me koi, or give me death. You love wildlife, fish, dogs, cats, gerbils, frogs, and bugs. You can't have enough. Ever. Heaven is living in a wildlife sanctuary with the lions. How much water is needed for a porpoise pond? Learn the habitat requirements of your wildlife friends and build them into your feature. Life is a party! 3 AM is your bedtime...every day. Your neighbors hate your wild parties...until they are invited. And OH! that pool...my pool...mine, JUST mine. Plan for humans...edging, seating, and maintenance are your watch words. Who are you? Plan for it! Everything else is secondary. A great design always fits within the context of its surroundings. Assess the garden and grounds as a whole, and make some key design decisions. Above Ground or Below Ground? Assess what fits best in your environment. Is the terrain flat and formal? Is it varied and informal? Steep? Is the house towering, or a low slung ranch? Now decide what is going to blend best with those inherent features, and "level with it"! Small, Large or Extra Large? Just because you are designing for a small garden doesn't mean that your garden water feature has to be small too! Think about the overall design of your garden space. Will it benefit from a large, central water feature? Are there other large elements that would keep it from taking the role of garden focal point? Is there a spot in the corner that just needs something...a place where a diminutive water feature would be just the ticket? Make a choice that delivers and stays true to the overall design of the garden. What's your style? Are you laid back or are you driven to perfection? Do you like a formal or an informal feel in your space? Is your garden in a cottage style or does it have a contemporary flavor? Stay true to your style by measuring your potential designs against these markers. Keep your Balance. Is your garden best served by an asymmetrical design, or a symmetrical design? Informal? Often, an informal design is best achieved using an asymmetrical approach. Do you prefer formal? You'll likely prefer a somewhat symmetrical design. Don't be afraid to challenge convention though...irregular forms can make very interesting formal gardens, and regular shapes can create a pleasant tension used in an informal setting. Let your inner muse be your guide. Know your Materials. Spend some real time learning what materials are available to you! Arthur Conan Doyle once said: "Mediocrity knows nothing higher than itself, but talent instantly recognizes genius." Be a genius! Use better than average materials wherever possible when constructing a garden water feature. The time spent to find the best materials to match your vision is worth the wait. Be different, and discipline yourself to find the best. Keep it Natural. 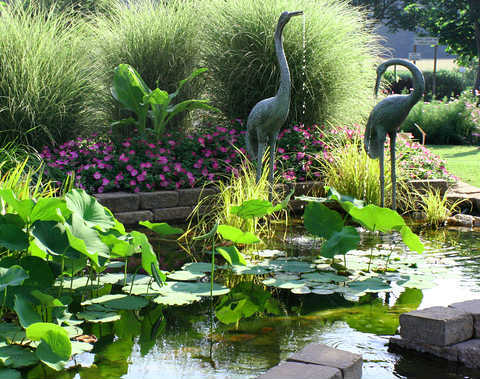 Creating a natural look is critical to the success of your garden water feature. Whether you are fashioning an informal natural stream or a symmetrical reflecting pool, concentrate on ensuring that every choice integrates well with the overall garden composition. Can you mix formal and informal? Absolutely. Can you do it without thinking about the overall effect upon the garden? No... Use design cues to integrate the elements and ensure unity. Site selection is among the most important decisions you will make in regard to your new garden water feature. It will make the difference between you being able to maintain the health of your feature and watching it decay into ruined oblivion. Ensure easy access - Remember to leave lots of room for access so that you can maintain, clean, and plant your water feature. Think about safety - Whether you have small children, or electrical elements are placed nearby, don't forget this important planning element. Take steps now to prevent accidents in the future. Plan for utilities - Most water features will require utilities within range, whether it be water to fill a pool, or electricity to run a pump. Think through the utility requirements before you sink in the first spade. Understand maintenance requirements - Most garden water features require some form of maintenance. Whether cleaning the pump or washing out the birdbath occasionally, before you build, decide whether or not you have the time to devote to this. A poorly maintained water feature is an ugly water feature. Don't fight Mother Nature - Topography, wind, rain, and wildlife all have implications to the success of your endeavor. Don't like frogs? Don't inadvertently build a wonderful habitat for them in your back garden! Leaves and garden litter can be a huge problem if you placed your koi pond under a conifer with cones! Think about the nature of your water feature and the habits of it's potential neighbors. Do they play together well? If not, make other plans! Get everything else right, and forget to ensure technical success, and all your hard work and planning goes down the drain...literally. A beautifully built, technically sound water feature may last many years, but if you build without understanding the technical aspects of your job you will experience some real disappointments. Planning is everything - Over and above the site selection criteria I identified above, there are other key concepts that are critical to success. Execute these important success criteria well. If you do not feel confident that you can do so, enlist help. Its that important! Use care in the placement of Rock Elements - Nature has a way...and to have a natural looking feature, we have to follow it. Rock in nature is laid very uniformly...yet never looks uniform. Spend some time looking into how to place rock naturally, placing each rock as you would find it in nature. Take a hike...and really look. Notice the strata lines in the rock, how in an area of similar rock, nature places each unique rock as a part of the whole. Each rock is "pointing" the same way. Set a plan for edgings and decks - These elements of your garden water feature must play well with the rest of the garden. Are you looking for a natural, woodland effect? Choose elements that are found in nature, and place them as you would find them in nature... in other words...not in a nice neat little row! Scatter them along the edge in a natural pattern to achieve the desired effect. 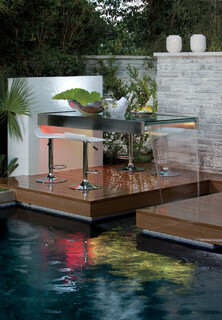 More interested in poolside decking? Select materials that blend well with the other permanent features of your property, such as boundaries, patio decking, and your home. Choose materials well - When choosing materials, always verify that the perfect material you found to use also has the strength to withstand the task of holding water in, is able to take a pounding day after day, and has the stamina to hold up for many years. What a disaster to put together a beautiful water feature only to find out that the materials you used will not hold up. It could literally mean a future where "the well is dry"! Let it breathe! 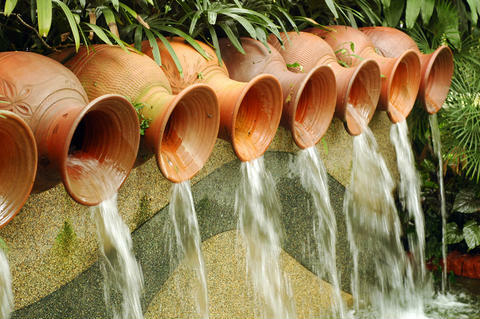 - Healthy water features maintain oxygen levels that keep algae from growing, odors from developing, and mosquitoes from making your house their home. If you have added fish to your water feature, this is doubly important! Lack of oxygen in your garden water feature can kill fish, and thus be a very expensive mistake! Those 'designer fish' can be pricey! Before you build, look into the costs, maintenance and technologies associated with your choices, and ensure you keep a healthy outlook! By now you are probably feeling like this is WAY over your head....Not so! Just recognize that a garden water feature isn't something you just toss out in the back yard and forget. It needs a solid plan, technical excellence, and great maintenance to bring that incredible moment of sheer beauty and spirit that we all long to find in our gardens. Get started now, but take it slow, educate yourself and build it right. Find that little corner of heaven in your back yard through solid planning and execution. most gracious features, if it has no water.